This is my latest Wenger knife and it is a really interesting one. It is an evolution Golfer 56 with number 1 56 49 300. This one is date labeled on the box 05 2011. First I would like to talk about the icon on the scale with the swinging golfer. During history this icon has seen different types with the crossed golf clubs and the square with golfer in it. This icon is new and was first used on the new developed Classic 85mm Wenger knives then the Evolution. There are some catalogues on the internet that you can use to date them. 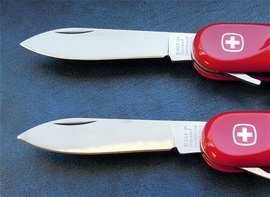 The tool configuration on this knife was already listed in the 1991 catalogue and different names for it has been used. 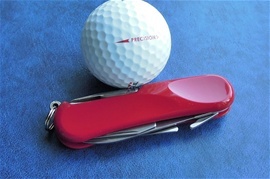 Golfer 56 or Golf Pro for example and different colors on the handle scales. The Golfer 56 with Red Evolution is absolutely the latest one according to my research. It is very important to remember with Wenger that inventions of functions can have variations and one cannot be too bombastic about exact dates for them. 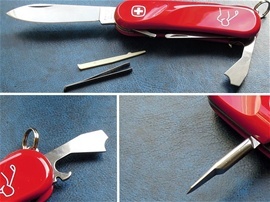 The Combination tool is one of Wenger special inventions and can be used to open cans, open bottle caps and it got a flat screwdriver tip. 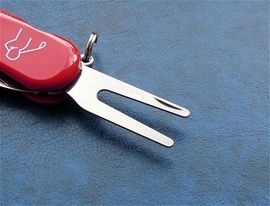 The Golfer 56 is a special purpose tool for Sports and got the main tools for such tasks. Green repair tool, club face cleaner and shoe spike wrench are tools for repair, maintenance and comfort during golfing. This knife is a special purpose SAK but also a tool that can be to identify with an interest. The Evolution model may be from 2008-2009. It may also be earlier. The combination tool also got the notch for cable or other tasks. 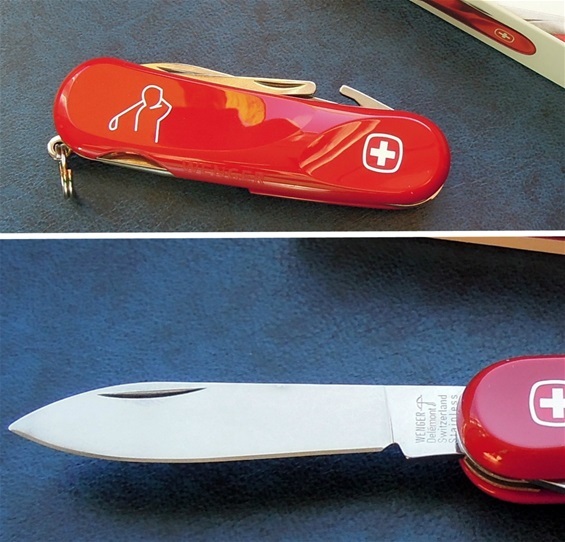 Some functions on a SAK are there to fulfill the usual tasks in the every day life, a knife blade and to be able to turn a screw for example. This i have noticed in history that Sportsmen knives even if they are special purpose got that ability to fit much more than what this designation typically is. The club face cleaner can be used to clean much more than golf clubs. 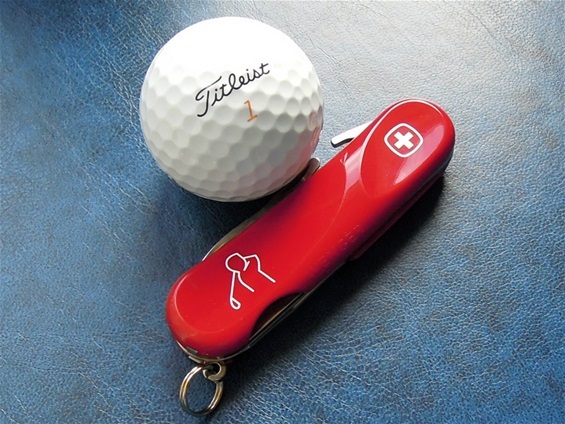 The green repair tool can be used to repair when a golf ball damages the green upon impact. The fork can be used on the sides and towards the center. I like the construction and lightweight SAK. Only 51 grams.. I have secured another Wenger Golfer 56 and it is perfect that one design factor was different compared to my other one explained from the top. The evidence is right there with the grind on the blade vs. the tang. It got a curve that is different. This was a recently changed design that was altered late in the history. First it was a straight line, then it got the angled grind and finally back to the more straight that you see on the top of this article. At some points both was used depending on designations and altered from time to time so you can find both very close to each other and sometimes on random. I found a few other things on these two and the Golfer 56 I show today is older than the top one. Most likely there is one year between the two SAKs. During 2003-2013 Wenger marked the boxes with a date. There are probably variations there too. The box date can be used to some degree but not always. It is a good help and it is a factor that should be used more. One must use a full look over before making sure. I have one more picture for you to the right with both types of Grinds. This type you can find at the same year and or by random from knives at the year 2011. 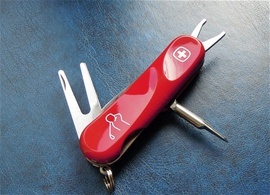 Remember with Wenger Swiss Army Knives with the blades or the functions that at some time in the production more knife blades or functions was produced so you have a time before the new design evolution really is 100%.